~~Not much going on around here…It snows, it gets warm, it gets cold, it snows….never ending cycle. March 21 I’m waiting for you…. ~~Grace my cat is sick. I don’t think she is going to be with us much longer. ~~I heard from my soldier. He has lovely handwriting. Wish “I” had that lovely of handwriting. ~~The girl and I are going to watch our DVR’d episode of The Walking Dead tonight. Seriously! Last weeks episode had the girl and on squealing and on the edge of our respective chairs the entire show. This past week flew by. Went to my parents house yesterday. Had a blast! I was looking at my mother’s hands. She has old hands. I asked her when she started getting the dreaded age spots. She said about 20 years ago….and I’m 20 years younger than her. Hello lotion, I’m your new best friend. My dad went to Georgia for some training for work. He left yesterday. He texts like a typical man. ~~Hope you have a good flight daddy. ♠ Rough flight. Squally kid beside me. ~~Sorry you had a bad flight. ♠ They don’t have a room for me. Said I have to pay for the room. Side bar….the room had already been reserved and paid for. So, we women sat wondering why they couldn’t find his reservation, upset that he would have to pay for the room etc. Half an hour later I get this. ♠ They found me. I’m at the wrong hotel. Thuh-won-teeee dollars for one pill?????? Let’s see…either I purchase groceries and gas or medication. Help me decide Bayer corp/Glaxo Smith Kline. 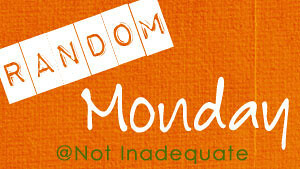 My friend Deb posted her random Monday. She suggested that we whine. I generally don’t do that here on the Internets. The people at home get to hear it. I’m going to give them a break, so for your reading pleasure I’m gonna whine. ~~ Weather! It is cold, then it is warm, then it is cold, then it is warm, then it is cold, then it is rainy, then it is windy, then it is cold. Please! Make. Up. Your. Mind! ~~ Neighbor’s dog! My neighbor has a rottie. She is an affectionate dog, but she doesn’t listen. They also don’t have a collar or leash on her. So she runs wild when they let her out. Runs wild all over the space that Chloe does her business. Which in turn makes Chloe very upset. So upset that she has to sniff every. square. inch. of. grass. before she does her business. Which in turn makes me have to stand forever outside~ because I’m a good dog owner, have a collar and leash on Chloe at all times~in the weather (see above). ~~ Gas prices. Nuff said. ~~ I tried to place a hold on a book at the library online last night. Seems as though my library card has expired. EXPIRED??? Why? why does a library card expire??? It just shouldn’t happen. Now I have to go all the way to the library, and renew my card. sigh. Happy Monday Internet! I have so much to tell!! ~~ These past few weeks I have been rather forgetful. Then a friend mentioned last night that if you don’t take your synthroid regularly then you forget stuff. errrrr….alrightythen! ~~ Week before last I adopted a soldier through AAUSS. I received my soldier 3 days later. He is 20, and is on the front lines removing IED’s. I have been in contact with him every day. I love it! So, Friday I mailed out his first care packages, but forgot to put the town after FOB. Now I’m thinking he isn’t going to get my lovely care packages. ~~ I also forgot about several appointments I was supposed to go to last week, and to pay my water bill. Hello synthroid!! ~~ It has been beyond cold here in Ohio these last 2 weeks. Wind chills of -15º. I haven’t ventured out much, but when I have I re-decide then and there that I’ll never live in Alaska. Ever.